No matter where you are diving your tank is an important part of your setup. Let’s face it, being able to breathe underwater is the thing that will keep you alive, and this is not possible without the proper tank. 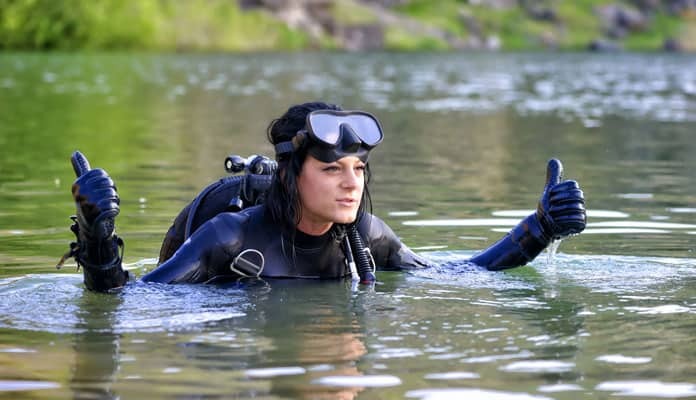 You can dive without a tank, and freediving is a popular water sport, but if you have not yet trained yourself to hold your breath for a long time, and want to stay under the water for more than 8 minutes, then a great scuba tank is the way to go. It is the single thing that is absolutely required and life-threatening to dive without. To get the best scuba diving tank, it is important to find one that fits you well. The best scuba tanks will be easy to use and will supply you with oxygen when you are under the water. 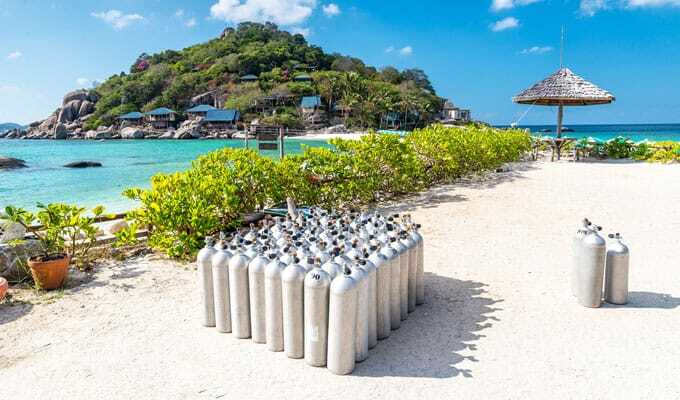 Scuba cylinders can be a tricky topic to navigate, but we have taken the time to gather all the information you need to make the best choice. Follow our buying guide, and you will be all set to purchase a tank which will enhance your diving experience and could save your life. Here are our top 10 scuba tanks for 2018. 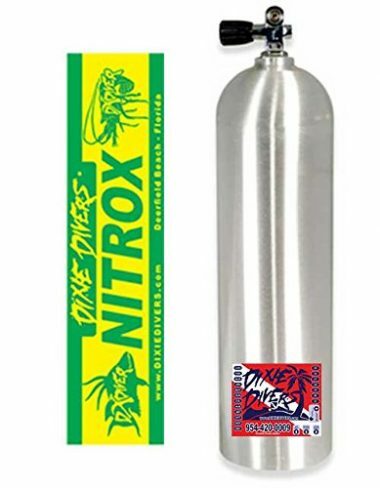 This is a great cylinder for all divers. The tank is small enough to be hauled around with ease and is easy to maneuver when you are in the water. The tank also holds enough oxygen to allow you to dive for a long time. We love the variety of colors that this tank comes in. There is a color to go with every outfit, and the bright colors allow you to be seen easily under the water. This tank is small and nifty. It does not take up much room in your gear bag, but it will allow you to hold a lot of oxygen. If you double up with this tank, then you can stay under the water for a long, long time. The tank is wrapped with carbon fiber and glass fiber to give you a strong and durable tank which will take impact well. The material will also not corrode over time. This is definitely a tank for someone who is moving from novice to professional diving, or for an advanced diver who wants to add some professional gear to their kit. A great tank for beginners, and you can get up to 30 minutes of diving time when you start out on your journey into the world of diving. As you progress and learn to control your breathing, you will find that this tank holds a lot of oxygen. With controlled breathing, you can get up to two hours of dive time on a single tank. This tank looks great. It has a brushed aluminum finish and a clear plastic webbed sock to protect it. At only 30 pounds, it is one of the lightest tanks on our list, making it perfect for new divers. The lightweight cylinder is easy to handle in the water, and easy to transport when it is out of the water and filled. The tank is perfect for scuba diving but is also a great way to charge a speargun when spearfishing. 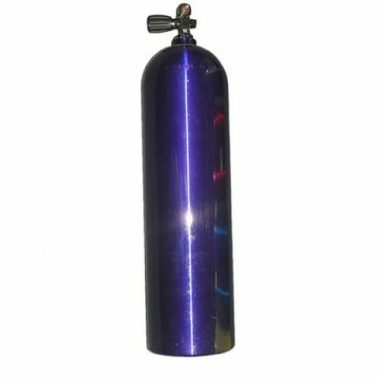 This aluminum scuba tank is expertly designed to maintain a negative buoyancy when underwater whether it is full or empty which will help to ensure you aren’t constantly floating towards the surface. It is worth noting that this compact tank measures in about three inches shorter than other tanks of its capacity making it lighter and easier to carry. This Luxfer tank is great for short recreational dives and even works well with side mount diving. Arguably the best and most versatile scuba tank company in the market, Faber delivers another incredible buy with this Blue Steel tank. Both the tank and the XS valve come nitrox ready. 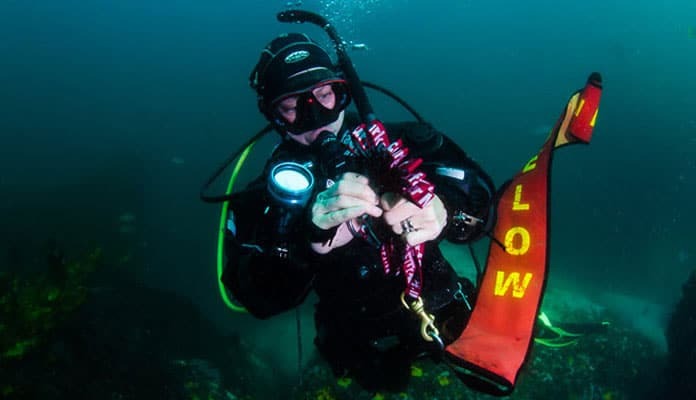 Negative buoyancy throughout your dive allows you to explore with ease while turning to more positive energy when empty helping you to get to the surface with ease. The steel cylinder allows you to shed excess lead during your dive making you more comfortable. This high capacity tank will ensure you can stay underwater as long as you want. The specially designed valve ensures you can’t overfill this large scuba tank and use it with yoke or DIN style equipment. A strong blue steel feature ensures you are getting a quality tank. This is the way in which it is made so don’t expect a blue colored option. Faber is a quality tank producer who has used their years of experience to create this outstanding piece of gear. Faber is one of the top selling scuba tank producers in the world. 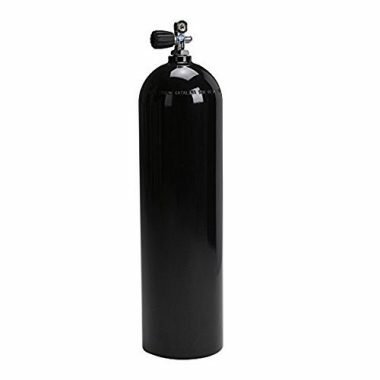 This tank is on the smaller side and will be useful in shorter dives or as a backup tank. Being able to use this tank with a Nitrox mixture allows you to not have to settle for a lesser air mixture. The valve is also universal and will not limit the BCD or regulator you can use. It also comes with a handy base that makes this tank easy to stand up so it’s not rolling around on the floor. This is a great dive tank for the intermediate user. The tank is large and will give you a lot of time under the water. 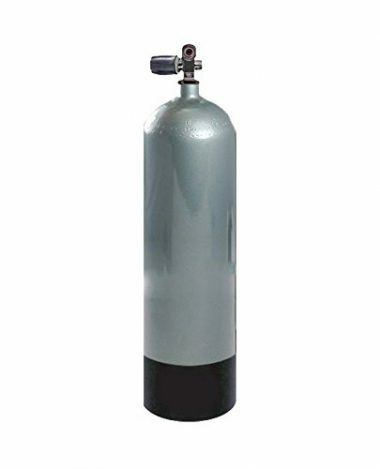 The downside is that the tank is long and heavy so we would recommend this tank to someone who has experience diving. Once you are used to having this tank on your back, you will find that it is a professional tank at an affordable price. When looking through scuba diving tank reviews you will notice how important it is to get a tank that fits your body in both size and weight. It is important to look for the following features. The standard 80 cubic feet (cf) is the most commonly used size by recreational divers. This is what typical diving companies rent out. Opting for a larger tank, 100 cf, is an excellent option for those who consume a lot of air or who are going on longer dives. Choosing a smaller 63 cf tank is a great option for beginners or kids. These are made using either aluminum or steel. Aluminum tanks are much more resistant to rust and start out negatively buoyant. These tanks turn more positive as the air is consumed. Steel cylinders are the sturdier of the two materials and also start out negatively buoyant. They either remain that way without air or turn towards a neutral buoyancy. This requires fewer weights to be carried. The choice is between aluminum and steel. Aluminum cylinders are negatively buoyant at the start of your dive and positively buoyant near the end. This may sound like a good thing, but it can make stopping for safety checks harder as you will be naturally floating toward the surface of the water, and you may need weights to keep you down. Steel cylinders stay negatively buoyant when you are in the water, so it is easier to contour your depth. Steel tanks are also more durable than aluminum, but they are also heavier. The most popular size of tank for most divers is 80 cubic feet, but dive tanks come in a variety of sizes. When people are learning to dive, a smaller than average tank is better. It will give the larger a chance to work with a smaller tank before they move onto something which is heavier and harder to handle. When you are looking at tanks, you should be aware of how much you can carry, and also your height. Longer tanks can be unwieldy for shorter people. You also want to think about how much oxygen you need. The more you have, the longer you can dive. There are a few accessories which you can add to your scuba tank to protect it and to make it easier to use. A cylinder boot will give the bottom of your cylinder a flat surface to sit on and will ensure that it does not get any knocks or bumps from being knocked over. A mesh protector sleeve will protect the outside of the cylinder and will protect from impacts. Valve covers help to protect the weak point on your cylinder. They help to keep dirt and water out of your cylinder. They also protect the valves from damage; keeping the oxygen contained. You can also add handles and carriers to your cylinder to help in the transport of your cylinders to and from the water. We also recommend having a compressed gas cylinder sticker on your vehicle when you are transporting your scuba gear. A high-pressure tank can hold more oxygen. They allow for a higher capacity at a smaller size. The downside is that they are a lot heavier and harder to wield. They also have to be specially filled. Many novice divers will only need the most basic scuba tank, but as you become more experienced, you may change the way in which you dive. Some divers like to dive with a high concentration of oxygen (20.9% is standard), and you can only do this with special equipment. The valve and the tank need to be compatible. The tank needs to be cleaned and serviced by a trained professional, and the filling of the tank needs to be done by a professional too. Q: Should I Buy Steel Or Aluminum Dive Cylinder? A: Steel cylinders are tougher than aluminum. They can take more impact while protecting the oxygen inside. The downside of steel cylinders is that they are heavier than aluminum. Both types will do the job for you, but you need to know where you are diving to make the best choice of cylinder. Steel cylinders are galvanized to prevent rusting and the toughness of the material allows them to withstand up to 300 bar of pressure. Aluminum cylinders will not add a lot of weight to your diving equipment, but they can only withstand up to 232 bar of pressure. Q: What Size Cylinder Do I Need? A: There are a variety of sizes available, and the choice will come down to many actors. 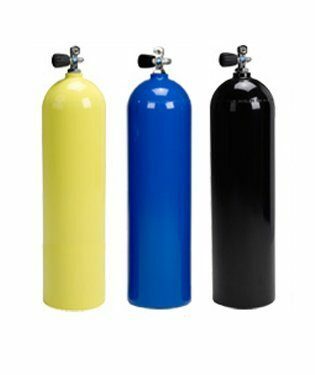 Obviously, the more oxygen you have available, the longer you will be able to dive, so if you are planning on being in the water for long periods of time, then you should go for a larger capacity. The downside of a large cylinder is that it is heavier. 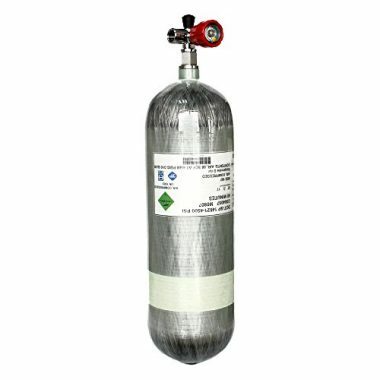 You should ensure that you are able to carry a large cylinder before you purchase one to dive with. The other thing to think about is the pressure of the water. Some cylinders cannot withstand a lot of pressure, so you may have to stay in shallower waters even though you have a large-capacity tank. Q: Should I Buy A 232BAR Or 300BAR Cylinder? A: Higher pressure means move volume inside your cylinder, but it also means a heavier cylinder. If you can get more oxygen in, then there is more weight. Cylinders which can handle more pressure also have more material to do so. Both cylinders may look alike, but the 300 bar cylinder will have thicker walls so it will be heavier. Q: What Type Of Cylinder Valve Do I Need? A: DIN valves are used for professional diving and can be used for 232 or 300 bar cylinders. A DIN valve is more secure and will keep your tank pressurized when you are under the water. An A-clamp valve is used for recreational diving and will only work with 232 bar cylinder. Q: Do I Need A Cylinder Boot? A: A cylinder boot will give your cylinder something to stand on when you are not using it. It connects to the bottom of your cylinder and gives it a flat surface to rest on instead of a rounded one. You do not need a cylinder boot, but we would recommend having one to prevent your cylinder from knocks and bumps. Q: How Many Tanks Do I Need? A: If you are buying a smaller tank, then you can double them up so you would want to buy twice as many. We would recommend having double the tanks you need for diving. If you are wearing one tank, then have two, so that you have a spare to switch to when one runs out. If you are doubled up, then have four tanks for the same reason. Breathing underwater is an incredible feeling. 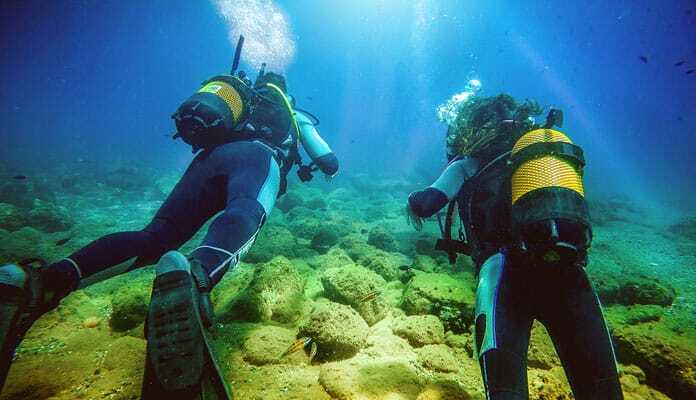 Being able to comfortably explore the underwater world while not worrying about maintaining buoyancy is one of your top priorities when you are diving. A great oxygen tank will give you this and more. 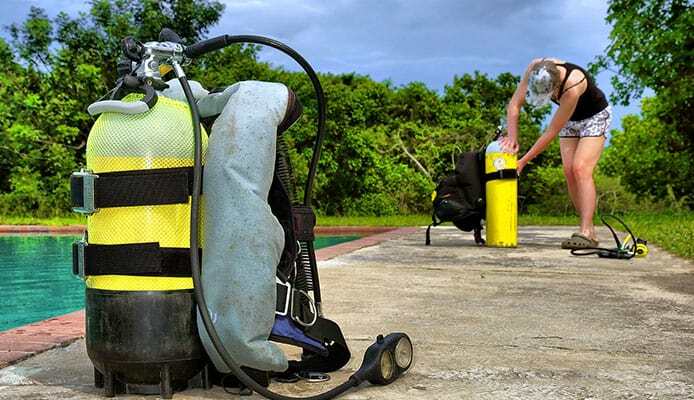 There are many accessories and pieces of safety equipment which we would recommend for diving, but a top-rated cylinder is where it all starts. Choosing a diving tank does not need to be stressful. If you take the time to understand exactly how diving talks work, then you can buy one with the peace of mind that you are buying something which will keep you alive under the water, and will not fail. Our list is packed with the best dive tanks on the market. There is something there for everyone. Do you dive using a scuba tank on our list? Let us know how it works for you in the comments section below.